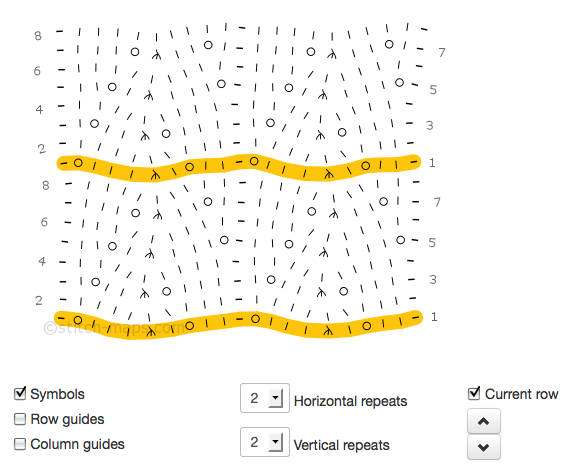 You’ll notice that two rows in the stitch map are highlighted. That’s because two vertical repeats of the pattern are on display. Both of the highlighted rows are row 1 of the Half-drop Horseshoe. No surprise here: clicking the up-arrow button moves the highlighting up one row; clicking the down-arrow button moves it down one row. Have fun with this new feature! During the beta period, it’s free for everyone, but soon it’ll be available only with a basic-level subscription.